Jonathan is the guy who has inspired me to be where I am today. He ignited my interest in menswear and set me on my sartorial journey. While looking around on the web for one thing or another I happened upon his blog, I read a bit, I read a bit more and then found myself searching for items that he has featured on his blog so that I could emulate his style. Every guys needs a little inspiration from time to time, and I’m sure that’s might be the reason that you’re reading this today. So maybe Jonathan Cavaliere can inspire you too. EG – How long have you been interested in menswear and who or what inspired your interest? JC – I have probably been inspired by menswear since I was 10 years old. At that age, it was more about a search for the man I wanted to become rather than just clothing. I idolized many different people whether they were actors, athletes, or people on the street, but I always found one common denominator, they all dressed well. At the age of 17 I started working in retail selling men’s suiting. Not knowing much about suits at the time I was determined to learn everything I possibly could which would allow me to be one of the best at my job. As the years went by I slowly honed my skill and menswear became more of a passion rather than just a job. JC – Thank you! Being crowded Canada’s Sharpest Man more than anything gave me the backing I needed to pursue a career in a female driven industry. Females whether its womenswear or menswear dominate the job market in Toronto and before winning my sartorial accolade I always found because I was young, male, and heterosexual there wasn’t going to be a place for me. Once I got the title I was contacted by many brands and guys who wanted to know my opinion on different menswear related topics which I feel in a way opened the door for other guys who want to pursue fashion as a career! The fashion industry is one of those career paths where you can dabble in so many different channels. At the moment, I am blogging on MrCavaliere.com full time, but I also do men’s personal shopping and image consulting on the side as well as creative direction for local menswear boutique. EG – I’ve seen a few styling projects of yours. Is this the way forward for you? Personal stylist? JC – At the moment personal styling and blogging have been awesome and brought up some great opportunities. The guys that I help on JonathanCavaliere.com are very grateful for my services and a lot of the time I feel like the only reason I put in the extra work is because of how appreciative my clients are. At the end of the day though you never really know what the future holds. JC – Well this depends on the season and the occasion of course, but I would say a white club collared dress shirt, my blue plaid wool waist coat, a grey tweed blazer, a paisley pocket square, royal blue chinos, a printed sock, and my navy wingtip boots. EG – You mentioned colour, pattern or texture there but if you could only have one which would you prefer? JC – I would definitely choose pattern. Pattern is one of those elements of dressing that guys stay away from but is ultimately the difference between a good look and a great look. Pattern can be as striking as color and can be confused for texture. It’s truly the secret that gives your outfit depth and visual interest. EG – You’re clearly on your A game, you must consume fashion every day. What would you recommend to my readers? EG – If you could have one fashion wish what would it be? JC – If I could have anything it would probably be a custom bespoke glen check 3-piece suit made to my exact specifications. EG – I’m with you on that one! Now lets flip that around; what’s your pet hate in menswear? I know at least two of them! JC – I actually have quite a few but if I had to choose one it would probably be tying your tie abnormally short. I’m not talking just above your belt buckle, I’m talking about those guys whose bottom two buttons of their shirt are exposed because their tie finishes in the middle of their sternum. 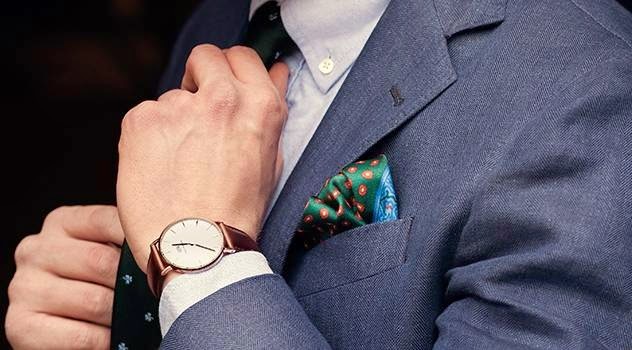 Chances are if you don’t take the time to tie your tie to the proper length the rest of your outfit was put together with the same carelessness. EG – Good advice on the tie! but what advice would you ofer to someone who came to you for help with an outfit for a summer wedding? JC – The great thing about dressing for summer weddings is that you can have a little more fun with fabric and color. I would do a slim beige cotton suit, a madras printed button down collared shirt, a navy knitted tie, a solid colored tie bar, a linen brown tipped pocket square, a braided belt, and a suede brogue. It’s breathable for the summers warm but smart enough that you won’t be underdressed. EG – Duly noted! I have two weddings coming up very soon! Time to go shopping! I’m staying over for one of them so what three essentials would you suggest that I pack in my case? JC – I don’t classify myself as an expert on packing but there are a couple of items I won’t leave without. I always pack great underwear first when I go away. I think there are a couple reasons why I do this. Firstly so I don’t forget it but secondly so I am comfortable where ever I am heading. Sometimes being away from home can be a pain and having comfy underwear can be exactly what you need to make everything a little bit more bearable. Who knows you might get lucky and at least you’ll be prepared! the perfect hold on my pin straight hair. If you’ve seen MrCavaliere.com a lot of my looks compliment a cleaner hair style and for this reason I can’t settle for a product that won’t give me the hold I need. So I never go away without it! EG – You mentioned ‘getting lucky’ So, It’s your first date (not that you, as a gentleman, would expect to get lucky on your first date of course) but s/he’s booked a table at a local restaurant, what are you going to wear other than great underwear? JC – On first dates I like to dress inconspicuously, but fashion forward at the same time. The reason why is because first dates should be about letting your guard down to allow yourself to get to know the other person and your attire should represent that. I also never wear a tie on a first date, and there are two reasons why. The first reason is related to the letting your guard down theory, it allows you to get to know the person without you looking like it’s a serious business meeting. The second reason is because it shows off your collar bone. Your collar bone is a place on your body that doesn’t build fat and when seen, it gives the illusion that the rest your body is just as chiselled as your exposed chest bone. Don’t take it too far though two buttons maximum. With this being said I would probably wear a button down collared shirt, a solid colored cardigan, a denim jacket, navy chinos, and a casual sneaker or leather boot. EG – Your wardrobe can’t just be full of great pieces. What’s the most horrible thing you own that you just can’t get rid of? JC – I own these black Adidas trainers that are destroyed and for some reason I can’t throw them out. I wear them when I’m cutting the grass or going to get the newspaper as they literally tear at the seams. It’s probably because they were the first shoes that I really wanted as a kid that my mother actually got for me! I usually would get an option between two pairs I didn’t like and would have to wear them till the sole fell off. This deprivation of shoes I liked may be another small reason of why I got into fashion! EG – We all have something like that. With that in mind, what advice would you give to a young man who wasn’t sure about his style and what choices to make? JC – A lot of people say start with the basics but I feel you should start with what not to wear first. One of the first posts I did on MrCavaliere.com was a what not to wear post because I think it’s more beneficial to know what not to buy before you go spending your money. In a way it’s like un-teaching bad sartorial choices so there is room for new good wardrobe decisions. After you’ve taken the menswear rules into account, then it’s time to start investing in your essentials! EG – Great advice! I know that you’ve done various collaborations and I’ve seen video of you too (see below)but what’s next for Mr Cavaliere? JC – At the moment I am just working on making MrCavaliere.com as good as it can possibly be. Like anything that’s worth it, it takes a lot of time and commitment and hopefully one day the Mr. Cavaliere can be a recognised style source for all things menswear related. At the end of the day you never know what the future holds that’s why I just taking everything one step at a time! I’d like to thank Jonathan wholeheartedly for not only being the subject of this interview, but also for being my initial inspiration which has taken me to where I am today. Check him out and I’m sure you’ll be inspired too. Craig of Eldred Grove reviews the Classic Warwick watch by Daniel Wellington. Daniel Wellington were kind enough to gift me the Classic Warwick watch, this will be the focus of this review. Established in Uppsala in Sweden, just an hour’s drive from Stockholm, there is a story about how the watch came to be and their website states: “Filip Tysander, the founder of Daniel Wellington, met an intriguing gentleman from the British Isles. The man had the inspiring ability to be gentlemanly but still relaxed and unpretentious. He had an impeccable style, and loved to wear his watches on old weathered Nato straps. His name? Well, Daniel Wellington, of course. A strong friendship emerged between the two, and our founder was inspired not only by the man’s many great life stories but also by his class and timeless style of fashion”. I’m not sure how true this is as is reminiscent of The Great Gatsby story. A part of me likes to think it is, but only the people at Daniel Wellington know the truth about that one.